Image provided by Jill M. Holslin. My first encounter with the borderwall between the United States and Mexico came summer 2003. I had left New York after 9/11, and was invited by the artist Marcos Ramirez (“ERRE”) to visit his Tijuana studio. His directions were simple: “It’s the first building on the right just as you go through the revolting door.” Having grown up in the linguistic borderlands of a bilingual family, I found it equally plausible that Marcos was either making a shrewd commentary on the door that served as the pedestrian port of entry into Tijuana, or that he simply meant revolving. The richness of the ambiguity stayed with me, and led me to the idea that architecture—in this case, a door in a wall—can be endowed with different meanings, either by accident or by design, and that architectural expression can be at the same time serious and humorous, and a powerful tool in polemicizing an architecture fraught with controversy. That same summer I met the architect Teddy Cruz and was introduced to his vision for design that transects the border. Fascinated by his approach of thinking perpendicular to the border, I became interested in the line of the border itself and the diversity of the landscapes it parallels. This eventually led me on a journey exploring the borderlands of California, New Mexico, Arizona, and Texas, where my creative practice worked on several design projects in the Big Bend region—projects that consistently explored ideas of political, cultural, and material dualities in design and architecture. At the same time my studio was exploring how to make buildings using mud and concrete (which we saw as conceptually parallel to the contrasts of wealth and poverty, the United States and Mexico, contemporaneity and tradition), we also considered ways that these material systems—and in many ways, the cultural values and economies of scale embodied by these materials—could be interwoven: two distinct elements working in concert. Some of these ideas culminated in a project entitled Prada Marfa, on which we collaborated with artists Michael Elmgreen and Ingar Dragset. Constructed near the U.S.-Mexico border along a desolate highway in the Chihuahuan desert, a faux Prada store, built of mud and containing the 2004 line of Prada shoes and purses, both epitomizes and exaggerates the cultural and geopolitical dichotomies of the borderlands. During the construction of Prada Marfa, we often witnessed helicopters descending on the horizon to pick up migrants walking through the desert. In fact, during our first visit to the building site for the project, several Border Patrol vehicles blocked our passage and agents surrounded us, demanding to know what exactly what we were doing there. The heightened security in the borderlands, in preparation for the imminent expansion of wall construction, further fueled our desire to consider how design could be a vehicle for addressing the politics of border security. As a finalist in the WPA 2.0 International Competition, my creative studio was able to explore the possibilities for political expression through architectural design. The competition, organized by the UCLA’s cityLAB, was inspired by the Depression-era Work Projects Administration (WPA) and the 2009 American Recovery and Reinvestment Act. This stimulus bill (the largest investment in public works in the United States since the 1950s) dedicated $150 billion to infrastructure, and designers were asked to envision a new legacy of publicly supported infrastructure—projects that would explore the value of infrastructure not only as an engineering endeavor but also as a robust design opportunity for strengthening communities and revitalizing cities. Our entry, Borderwall as Infrastructure, sought to integrate water, renewable energy, and urban social infrastructure into the design for the borderwall and to challenge the very existence of the wall in its conception, function, and future. At that time, the design proposals suggested an intervention. 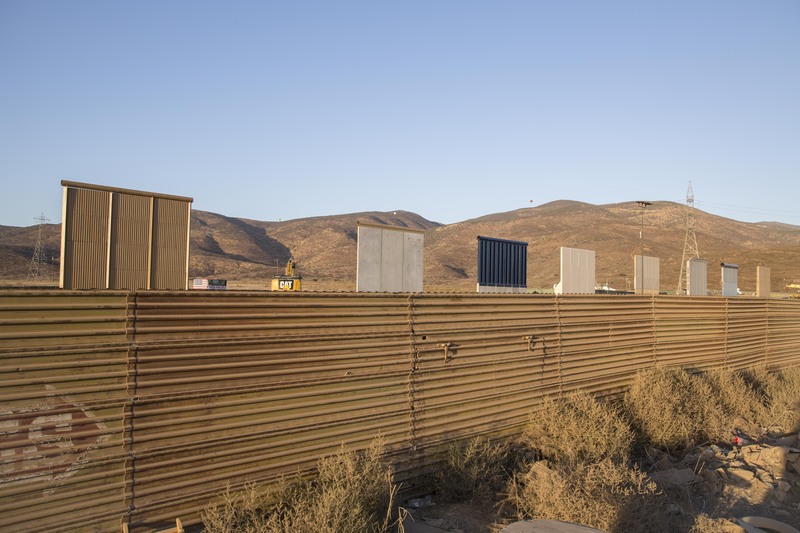 Since the wall was well on its way to being constructed on a massive scale, the attempt was made to demand wall builders to be more concerned with the landscapes that were about to be divided by the wall, and we made that pitch to lawmakers in Washington D.C. with the proposals. The project was the catalyst for the book, Borderwall as Architecture: A Manifesto for the U.S.-Mexico Boundary; however, this book no longer seeks to intervene in the wall’s construction but instead seeks to consider its transformation—an expanded study on rethinking the existing wall by redesigning it into something that would exceed its sole purpose as a security infrastructure and ameliorate the wall’s negative impacts and, perhaps through intervention, make positive contributions to the lives and landscapes impacted by the borderlands. The work compiled in Borderwall as Architecture continues the exploration through a collection of anecdotes, essays, models, drawings, stories, and speculations. In addition, short reactions are offered by border scholars that present intimate and diverse perspectives of the wall. Thus, it also protests against the wall—a protest that employs the tools of the discipline of architecture manifest as a series of designs that challenge the intrinsic architectural element of a wall charged by its political context. The wall is a spatial device that has been inserted into the landscape, but with complete disregard for the richness, diversity, and complexities of the areas in which it was built and proposed. This book advocates for a reconsideration of the existing wall, both through design proposals inspired by people living along the border who see the wall as something to respond to in positive ways and through proposals that are hyperboles of actual scenarios that have taken and continue to take place as a consequence of the wall. These propositions presume the somewhat ridiculous reality of nearly 800 miles of border fortification while suggesting that within this enormously expensive and extremely low-tech piece of security infrastructure lie opportunities for the residents of this landscape to intellectually, physically, and culturally transcend the wall through their creativity and resilience. The work is meant to be at once illuminating, serious, and satirical in order to expose the absurdity and the irony of a wall meant to divide but that has brought people and landscapes together in remarkable ways. The work is meant to be at once illuminating, serious, and satirical in order to expose the absurdity and the irony of a wall meant to divide but that has brought people and landscapes together in remarkable ways. 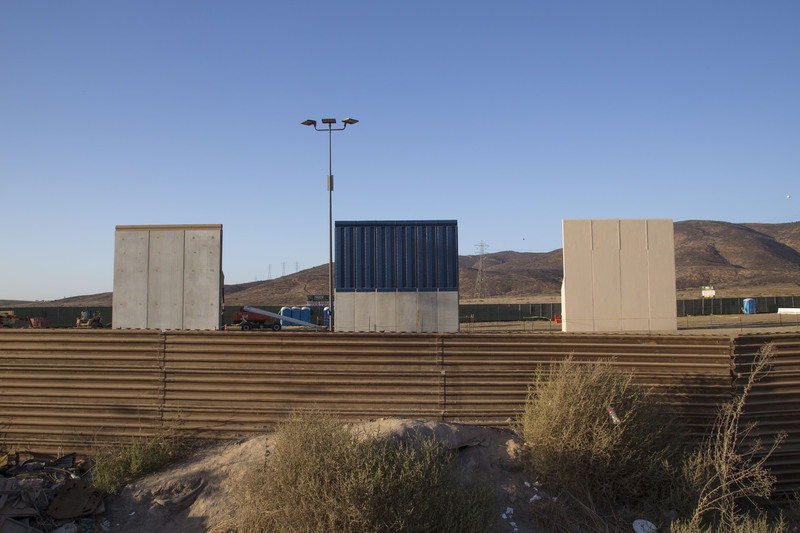 Because of the questionable functionality of the wall, artists and designers see its shortcomings as doorways into questioning the wall, smuggling creativity into the borderlands demonstrating that creativity is an important component of resistance. For example, Ana Teresa Fernandez, a Mexican artist from Tampico, Mexico, participates in erasing the wall wielding a paintbrush. By selecting paint the color of the sky, Fernandez subverts the prison-like solidity of the rusty steel of the borderwall with a thick coat of blue paint so that the columns become one with the gaps between them, creating a visual illusion—and perhaps for some, a premonition—that the wall is no longer there. Residents of Tijuana have taken much pride in this installation, protecting it from others painting over it or removing it. In many ways, they consider it a kind of monument—albeit an invisible monument. The irony is that if the wall is ever dismantled, Fernandez’s invisible wall might remain. Just two weeks ago the prototypes for Trump’s borderwall were unveiled near San Diego. One of Trump’s hopes for the wall, in addition to being “big” and “fat,” is that it would also be “beautiful.” One of the 30’ x 30’ prototypes, which cost $406,318 to construct, is painted sky blue, and I can’t help wonder if borderwall activism has come full circle, with ELTA North America, the construction company who built this wall, co-opting Ana Teresa’s invisible wall to meet the demands of the call for proposals which required the wall to be “aesthetically pleasing.” There are seven other prototypes constructed to demonstrate Trump’s ambitions for borderland security, most at a cost approaching half a million dollars. While it is uncertain what is to become of these prototypes, what is certain is that, as Ralph Waldo Emerson once wrote, “every wall is a door,” and in this case, each of these walls are doorways to a continued interrogation by artists and designers whose creativity has the ability dismantle the desires for division. Image courtesy of Ana Teresa Fernández and Gallery Wendi Norris. A revolving door in Spanish is puerta revolvente. Revolvente might easily be misinterpreted as a cognate for revolting, because the Spanish reflexive verb revolver also can refer to an upset (turning) stomach. An expanded text on Prada Marfa can be found in Dominique Molon, Ronald Rael, Michael Elmgreen, and Ingar Dragest, Prada Marfa (Berlin: Walther König, 2007). For more information about WPA 2.0, see About WPA 2.0, University of California, Los Angeles, http://wpa2.aud.ucla.edu/info/index.php?/about/about/. Jennifer Medina, Josh Haner, Josh Williams, and Quoctrung Bui, “Eight Ways to Build a Border Wall,” The New York Times, 8 November 2017, https://www.nytimes.com/interactive/2017/11/08/upshot/eight-ways-to-build-a-border-wall-prototypes-mexico.html. Ronald Rael is Associate Professor in the departments of Architecture and Art Practice at the University of California, Berkeley. He is the author of Earth Architecture, a history of building with earth in the modern era that exemplifies new, creative uses of the oldest building material on the planet, and earlier this year, Borderwall as Architecture: A Manifesto for the U.S.-Mexico Boundary, together with Marcello Di Cintio, Norma Iglesias-Prieto, and Michael Dear. The Museum of Modern Art and the Cooper Hewitt Smithsonian Design Museum have recognized Rael’s work, and in 2014 his creative practice, Rael San Fratello, was named an Emerging Voice by the Architectural League of New York.